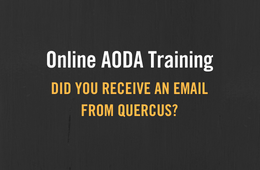 Did you receive an email from Quercus about U of T’s online AODA training? The University’s Accessibility for Ontarians with Disabilities Act (AODA) Office 30-minute online training modules are moving from Portal to Quercus. As a result, notifications asking participants to register as a student in the course are being sent out by Quercus <notifications@instructure.com>. If you are concerned about the legitimacy of this email, you can access the AODA course by logging into Quercus (q.utoronto.ca). You can also access more information on the HR & Equity website: http://aoda.hrandequity.utoronto.ca/service-resources/. All University of Toronto employees must complete the online AODA training, as it is a legislative requirement. Please direct all queries to the AODA Office at aoda@utoronto.ca. For technical issues using Quercus, please contact q.help@utoronto.ca. For anything else related to this training, please email aoda@utoronto.ca.